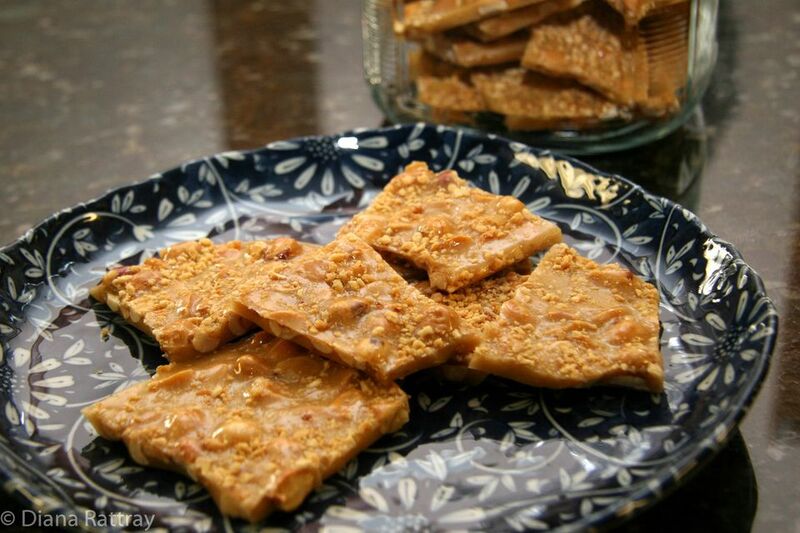 This peanut brittle is made with honey roasted peanuts which are in the brittle. Finely chopped peanuts are sprinkled over the peanut brittle before it hardens. Peanut brittle is not difficult to prepare and cook, and it doesn't take long. The trick is getting the syrup to the right temperature. The best way to be sure your candy is ready is to use a reliable candy thermometer. You can easily test your candy thermometer for accuracy. See the instructions below the recipe. Generously butter two 15-by-10-inch jelly roll pans or one 17x12-inch half sheet pan. Grind 1/2 cup of the peanuts in a food processor until very fine; set aside. Put the remaining peanuts in a bowl and set aside. Put the butter and vanilla together in a small dish and set aside. Put the baking soda in a small cup or dish and set aside. In a heavy 3- to 4-quart saucepan over medium-high heat, bring the sugar and water to a boil, stirring with a wooden spoon. Add the corn syrup and cook without stirring to 280 F.
Add the 2 cups of honey roasted peanuts and continue cooking, stirring, to 300 F. Remove from heat and quickly stir in the butter and vanilla. Stir in the baking soda. Immediately pour the mixture into the prepared pans. Spread with a heat-resistant silicone spatula or use forks to pull the mixture to spread in the pan. Sprinkle with the reserved 1/2 cup of ground peanuts and pat with a spatula to help them stick to the brittle mixture. Let the brittle cool and break up when thoroughly cooled. To be sure your candy thermometer is accurate, test it in boiling water. Attach the candy thermometer to a saucepan about half full of water. Don't let the tip of the thermometer touch the bottom or side of the pan. Bring the water to a full boil and continue boiling for 4 or 5 minutes. At sea level, the candy thermometer should register 212 F (100 C). If you are at a higher altitude, your water will boil at a lower temperature. If your candy thermometer registers 210 F and you know the boiling point is 212 F, your thermometer registers 2 degrees cooler. So boil the syrup to 2 degrees lower than instructed. If it registers 217 F — 5 degrees above — you will want to add 5 degrees.